Livraison super rapide et colis très bien emballé. Concernant la batterie, super punch au démarrage et plus de 2 kgs gagnés sur la batterie d'origine. Pas assez de recul pour juger sur la durée. 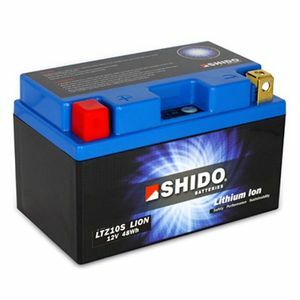 Great service and a great product, easy to fit as the size of the battery is identical to the original and the battery was fully charged when it arrived. Works a treat. Transformed starting the bike and very light. After what appeared to be the wrong battery I watched a You Tube clip and simply turned the battery on its side and the terminals then where the right way around. Shame there is no instruction to make you aware!!! Great product and so light and works great. Rätt produkt Levererat enligt utlovad tid. Excellent service from Tayna. DPD, however let the side down by sending my battery to Belgium for some reason then leaving it there for 2 days! I subsequently fitted this battery to my bike and it certainly turns over faster than it did on old battery. I now plan to replace battery on my other bike with a LiPo once it starts to get tired. Additionally I reduced the weight of my bike by ~2kgs.